Successful Leaving Cert results recipients, including obligatory jumping Loreto students. Blummin’ good at rote-learning tykes. From top: Afghanistan-born Navid Safi at O’Connells School. Richmond Lodge, Dublin. Centre; Breenan Cullen, Hannah Smith and Julie Masterson at Loreto, Stephen’s Green, Dublin. Above:: Diana Bannaya, Tiffany Bramble, and Shannon Talbot at O’Connells. 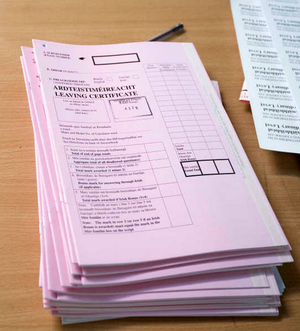 Posted in Misc and tagged Leaving Cert at 1:08 pm on August 12, 2015 by Broadsheet. Am I on the RTE website? Anyone named Tiffany Bramble will go a long way. what’s the bets Diana Bannaya is nicknamed ‘diana banana’ by her mates? I went to O’Connells in the 70’s. Jaysus I’m old. You are better than this BS. Cease and desist! I predict there will be lots of pictures of teenage girls with their results tomorrow on the front page of all the paper. Always teenage girls. Ah well, give it a few years and the boys will be all over the business pages and the girls nowhere to be seen. Even creepier when they do it with the Junior Cert results girls. Ye,It’s a pity creches dont have exam results. The Irish Independent use ANY excuse to put nice looking girls on their pages. Good Weather? Girls sunbathing in St. Stephen’s Green, Brittas Bay, etc. Bad Weather? Girls wearing white t-shirts getting soaked. Social Welfare Fraud? Trampy looking single mother. Imprisoned in Peru for drugs smuggling? Pictures in your nightclub dancing outfits and bikinis. I can’t believe I’m the first to comment on the cyclist on the pavement! For shame, BS commenters, for shame. 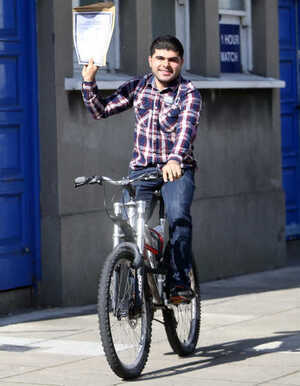 But he’s passed his senior cycle! I was going to be the first to leave a comment with my “Congratulations Navid on your…….€40 on the spot fine for cycling on the footpath”. But then I realised that cycling on the footpath is not in the list of fines (unless it’s considered cycling dangerously) and then the keyboard warriors would be out in force and then it would detract from the standard issue jumping teen girls piece. So nearly bet ya, Yea. Thanks for telling us that the first guy is from Afghanistan. Dunno why you felt the need to bring that up!